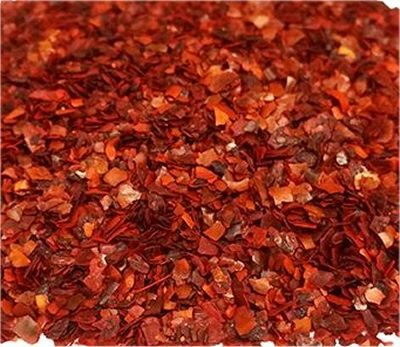 Aleppo Pepper Flakes is made from Crushed and Ground Dried Aleppo Pepper Pods. The Aleppo pepper is a variety of Capsicum annuum used as a spice, particularly in Middle Eastern and Mediterranean cuisine. Also known as the Halaby pepper, it starts as pods, which ripen to a burgundy color, and then are semi-dried, de-seeded, then crushed or coarsely ground. The Aleppo pepper pod is similar to a jalapeño: two to three inches in length, long and slightly curved. Though, the Aleppo's tip tends to form into a narrower point. They age into a deep red. But, again, this is not likely how you'll become acquainted with this chili. It's more commonly dried and crushed into flakes.